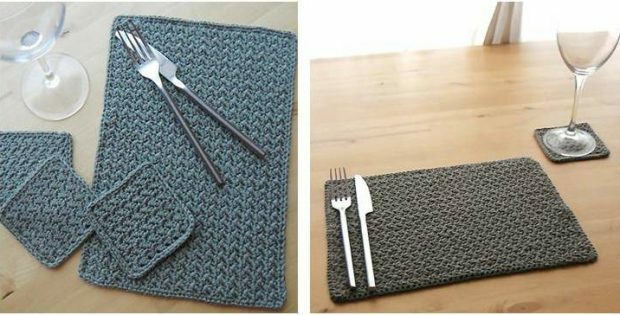 Make this nifty Grit Stitch crocheted table setting for an even lovelier dining room. The simple and clean design will definitely make your table look even more inviting. Craft in your favorite color for a personal touch! In fact, this pattern is a great project for experienced beginner crocheters looking to advance their crochet skills. The pattern includes detailed written instructions on how to make the placemat and coaster in one size. As always, you can tweak the directions to make them any size you desire. This crochet pattern is another lovely design by Nicola Schofield. In fact, you can access the FREE pattern for this crocheted table setting from the Ink Flamingos website. Featured image: Ink Flamingos/ Neschof – thank you!